Curb appeal is big. Just as we understand that the main purpose of a resume is to get you an interview, curb appeal needs to get potential buyers in the door. First impressions of the exterior are critical. Overgrown shrubs, gardens surrendering to weeds, and out-of-control perennials and vines, can turn prospective buyers away. Job applicants rarely show up for an interview in disheveled, grungy attire. Likewise, an unkempt exterior is not often associated with a well maintained, clutter-free home. Ultimately, the gardens and property should be inviting, clean, neat, healthy and reflect good maintenance. The same objectives that guide a professional home stager also apply to the exterior. De-cluttering and rearranging furniture inside a home will enhance its appearance and sale ability, but un-cluttering the exterior and rearranging some plants may be more important. While kitchens and bathrooms are generally believed to have the greatest potential for return on investment (ROI) – 68 to 80% respectively, you may be surprised at the ROI for outdoor work. The National Association of REALTORS®’ (NAR) and the National Association of Landscape Professionals in the U.S., provides some encouraging statistics about the potential ROI for landscaping. 1 According to Remodelling magazine (www.hanleywood.com), the ROIs for new insulation, vinyl siding and hardwood floors are 95-108, 83, and 95% respectively-not bad. But landscaping improves your odds even more, with ROIs consistently above 100. Three exceptions are new pools (50%), and fire pits (78%) and outdoor fireplaces (60%). According to NAR, a minor landscaping upgrade such as adding planters, a flagstone pathway, a few flowering shrubs and a small tree, provides an average return of 105%, similar to the return for a new patio or deck. Lawn care (fertilizing, aerating, weeding and raking) nets the greatest return, up to 3 times the original investment. An inexpensive and even simpler approach, for a few hundred to a few thousand dollars, would be to edge the gardens, and purchase mulch and colourful plants. Nothing beats clean, crisp garden edges and fresh mulch for a polished look. 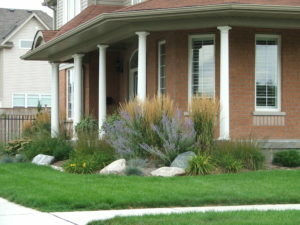 Better yet, why wait until you decide to sell your home, to upgrade your landscaping? Not only will you make changes with a high ROI value, but you can enjoy other benefits. The JOY Score is a calculation of the happiness and satisfaction that homeowners reported for their renovation projects.1 An overall landscape upgrade received a JOY Score of 9.8 and an ROI of just over 100%. A winning combination for homeowners, with immediate and a long-term returns. The2016 Remodeling Impact Report: Outdoor Features(National Association of Realtors® and the National Association of Landscape Professionals; https://www.nar.realtor/sites/default/files/reports/2016/2016-outdoors-remodeling-impact-report-09-27-2016.pdf).